The great diversity found in Paul Ahyi's Art work is particularly felt in his ceramics. They come in all sizes from the smallest pot to the biggest mosaic fresco. What is more amazing is the diversity in style and shapes. One can feel not only the work on amazing textures but also the search for color and glaze effects. 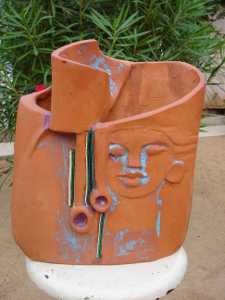 One can feel not only an expression of African Art through the ceramic media but also a thorough study of abstract rendering of shapes that bring his work at the fore front of Modern Art. 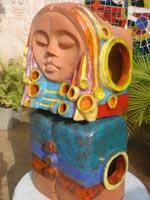 The African Woman portrayed by the ceramic above is a typical exemple of the ability of the artist to surprise us. For whoever knows his style, the shape of this face is unique in the work of Paul Ahyi. The beauty of the work make you forget the technical difficulties. These ceramics are litterally sculptures, they seem to have been carved off a solid material. The ceramic murals are somewhere in between mosaics and bas reliefs. The vibrant colors and the patchy shapes of the ceramic pieces give the mosaic feel. But these shapes and their sizes are dictated by technical (shrinkage and breakage risk during firing) as well as aesthic reasons. However, these are not flat tiles. These are in fact three dimensional figures forming a real bas relief. The vibrant colors of Paul Ahyi's murals give life to the walls they decorate. The Image above is only a portion of the total art work. It has been reconstituted by putting together several photos taken along the wall. This bas relief decorates the side wall of a Super Market in Lome (Togo). Looking at the small ceramics of Paul Ahyi, they appear like an experimental ground where the artist tries his new ideas. They are not a reduced scale of the bigger Art Work. On the contrary the artist seems to develop a particular technical or design aspect of his work. One would easily imagine the face of the pot above, on a mural. or as a part of a stacked multi-level ceramic. Similarly the pot on the right shows a quest for a design with pure lines very modern but also definitely African.